Mozzarella sticks are a family favorite, and without a doubt one of the most expansive foods to buy; and you get hardly anything in the box! Plus all the ingredients in those cheese sticks you cannot even understand. I have decided to cut out buying them and make my own! I mean come on! It is easy, and absolutely 100 percent better than store bought. Try to convince Daniel that store bought are a waste... well I did with these homemade crispy cheese-y sticks; you've gotta try! Use your favorite dipping sauce, I use OrganicVille marinara sauce and boy oh boy these are amazing! 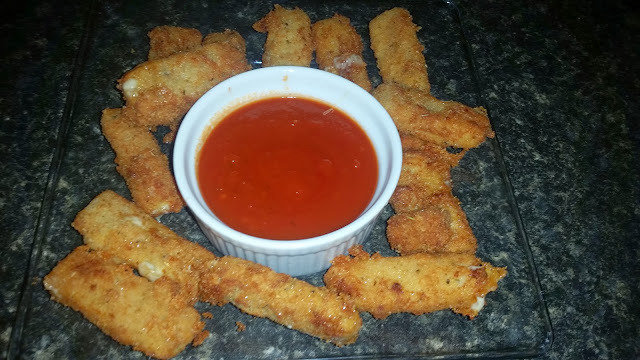 Super easy and you can have them on hand any time you want some funny, organic, simply made mozzarella sticks.